In a world overwhelmed with vivid images that are appreciated by the naked eye, there is another world - a tiny one. It is so tiny, in fact, that we simply cannot see the world. Even a light microscope is unable to detect these images. This tiny world is nanotechnology. In this type of technology, the special properties of DNA are harnessed to produce valuable structures. When many of us think about the transmission of information, we think about DNA in a biological sense. However, it acts more like a structural substance in nanotechnology. With the power of DNA structure, applications in computing and molecular biology can be a reality. To truly get a sense of how DNA and nanotechnology operate, it is important to understand just how the scale and units exist. If you think about a millimetre, it is a thousandth of a meter. If you think even smaller than that and imagine a micrometer, it is a millionth of a meter. Now, consider that a nanometer is still significantly smaller than a micrometer. One nanometer is a billionth of a meter and smaller than the wavelength of visible light. To put it into more perspective, picture a human hair. Try to think about the fact that a nanometer is a hundred-thousandth the size of a human hair. DNA combines with nanotechnology to offer us an enormous range of benefits. If you think about the structure of DNA, it consists of a double-stranded molecule. This molecule can unzip to form somewhat of a branched molecule but these branches can also be woven into structures that can self-assemble. Through the use of a double-stranded molecule of DNA, scientists can unzip the molecule partway and the branches will join with complementary sequences on the other DNA that similarly branches out. With the right guidance, the DNA molecules can be joined in a way that they provide valuable structures that support many different applications. We already use science to create long stands of DNA in many sequences but there is a lot of data held in the nucleic acids. As such, researchers should theoretically be capable of building complicated, useful structures from DNA. 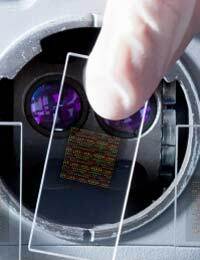 In terms of practical applications, DNA-based nanotechnology will hopefully one day be used to build electronics. Scientists anticipate that these types of building materials for electronics could mean that molecular electronics are much more rapid, smaller and efficient than electronics today. Also, medical applications such as drug design can benefit from this type of technology. Some molecules are unable to crystallize without aid but DNA could provide the necessary support, which would then facilitate X-ray applications to snap images of the molecular structures. Also fascinating is the idea that DNA can be combined with nanotechnology to build synthetic fibers. One day the creation of nanorobots may even be possible, which means that a structure could be created to trigger medical reactions in humans. Unlike the large, life-like robots many of us imagine when we hear the word 'robots,' these nanorobots are tiny but still have incredibly useful applications. Still, the technology is not without its challenges. Scientists will have to find a way to successfully bring together all of the different building blocks to make this technology a reliable reality. Not only that, but working in three dimensions is an enormous challenge. While researchers have comfortably mastered the challenge of sorting out DNA in two dimensions, they still struggle to advance into three-dimensional work. Another issue is that DNA has an electrical charge, which interferes when nano-scaffolds are built for electronic equipment. Fortunately, there are other nucleic acids such as peptide nucleic acids that do not have an electrical charge and may work as a substitute for DNA. Another potential substitute is RNA, which is not as stable as DNA but is still quite similar and also plays a vital role in the production of proteins. One particularly grave concern is the potential for mistakes to occur during assembly. With test tube experiments thus far, there are already errors in the structure and if the technology advances to allow for the production of large quantities, then the consequences could be harmful. DNA comprises life as we know it but in today's world of rapidly advancing technology, researchers plan to use this complicated and important molecule in nanotechnology to produce and refine many applications that will improve our lives. With everything from building electronics to creating robots, nanotechnology has the potential to merge with DNA to bring about dramatically improved quality of life for everyone.